'Ghost Story' starring Fred Astaire, Melvyn Douglas, Douglas Fairbanks & John Houseman is coming to DVD and Blu-ray for the first time in the U.K. on 7th December 2015 courtesy of Second Sight. It was one of the most talked about horror films of the early 1980s, thanks, in no small part, for the wealth of Hollywood royalty nearing the end of their careers starring in what was, for many of them, the first and only horror film of their working lives. The film, based on the acclaimed Peter Straub bestseller (rated by Stephen King as one of the finest examples of the craft of the late 20th century) stars screen legends Fred Astaire, Melvyn Douglas, Douglas Fairbanks Jr and John Houseman. Three of the four were making their final film appearances ever, with the acclaimed horror proving to be a fitting epitaph for their talents. The film also stars a haunting Alice Krige (Star Trek). 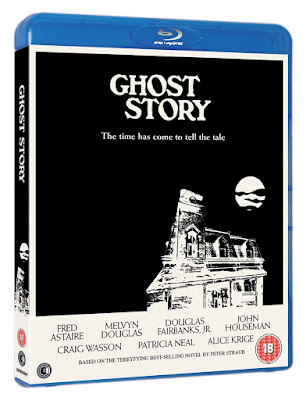 Ghost Story follows a quartet of elderly friends who while away the time in their dotage by telling each other spooky stories and creepy tales as part of their Chowder Society group. Click below to pick up a copy on Blu-ray or DVD. Or why not pick up the best selling novel by Peter Straub..